Plan to drive more this summer? Annoyed by the price of gas? Complaining that oil companies rip you off? I say, shut up. Even if gas costs $4 per gallon, we should thank Big Oil. Think what they have to do to bring us gas. Oil must be sucked out of the ground, sometimes from war zones or deep beneath oceans. The drills now bend and dig sideways through as much as 7 miles of earth. What they discover must be pumped through billion-dollar pipelines and often put in monstrously expensive tankers to ship across the ocean. Then it's refined into several types of gasoline, transported in trucks that cost hundreds of thousands of dollars. Finally, your local gas station must spend a fortune on safety devices to make sure we don't blow ourselves up while filling the tank. And it still costs less per ounce than the bottled water sold at gas stations. If government sold gas, it would cost $40 per gallon. And there would be shortages! Another myth: Big Oil makes "excess" profit. Nonsense. The oil business is fiercely competitive. If one company charges a penny too much, other companies steal its business. Apple's profit margin is about 24 percent. McDonald's makes 20 percent. Oil companies make half that. Per gallon, ExxonMobil makes about 7 cents. Governments, by contrast, grab about 27 cents per gallon. That's the average gas tax. If anyone takes too much, it's government. President Obama says, "Gas costs too much." So he announced: "We've put in place the toughest fuel economy standards in history. 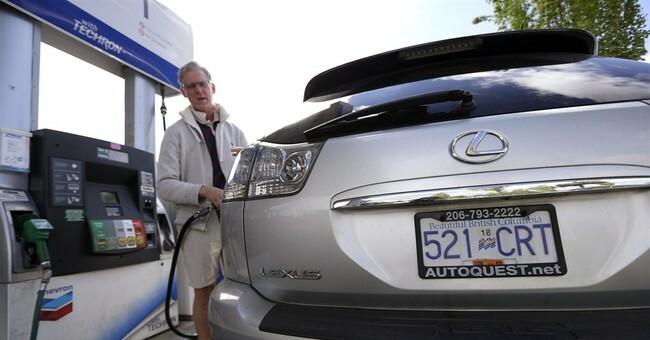 Over the life of a new car, the average family will save more than $8,000 at the pump." Sounds good. But the magic of fuel economy standards is another myth. Susan Dudley, who runs the Regulatory Studies Center at George Washington University, points out that many car buyers care more about safety, style, power, etc. than mileage. "The problem with the government's rule is that they ignore all those other preferences ... assuming that the only thing we value is fuel economy." Fuel economy sounds appealing when it's presented as something created at no cost. But car dealers say it will make cars cost $3,000 more. Also, as James Taylor, an energy expert at the Heartland Institute, pointed out to me, fuel-economy regulations kill. "In order to make cars more fuel-efficient, auto manufacturers make them smaller -- using lighter materials, they're less crash-worthy ... We're seeing thousands of people dying on the roads that shouldn't be." You'd think automakers would strongly oppose these regulations -- but if so, why, when President Obama unveiled the regulations, did the heads of 13 car companies shake Obama's hand and smile? "Even if it is a $60 billion cost to them," says Dudley, "if everyone has to do it, they can pass it on to consumers." In other words, normally companies compete to do things more efficiently than rivals, in order to charge lower prices and get the lion's share of customers. But there's no need to worry about jacking up your prices when your rivals must do so, too. Regulation makes companies lazier, not more efficient. Republicans at least talk about deregulation. But the "regulation-killing Republican" is another myth. Despite being labeled a deregulator, George W. Bush hired 90,000 new regulators. Dudley, who was their overseer, now says, "The pressure to regulate is intense." Almost no one seems to speak up for a true free market in energy, with competition, innovation and unfettered consumer choice. People say regulation is needed to counter industry "greed." But if anyone's greedy here, it's government -- and unlike oil companies, government doesn't have to work hard and compete to give you good service at the lowest possible price. Government just sits there, telling companies to charge less, telling car companies to make smaller and more dangerous cars, mandating and subsidizing alternative fuels like ethanol -- and then telling us that we benefit from the politicians' efforts. The truth: We rarely benefit.